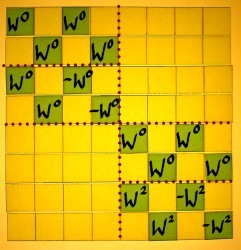 Even when we confine ourselves to radix 2 FFT, there are four basic schemes. 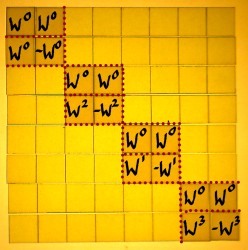 They are the classic Cooley-Tukey and Sande-Tukey algorithms. Only one of these was illustrated on the preceding pages. I want to explore the other three schemes as well. They have so much in common, yet the differences are decisive and they are not to be mixed or confused. First I will discuss some details of these differences. At the end of this page, the four schemes are put together, for overview. They are matrix visualisations of butterfly graphs like those printed in The Fast Fourier Transform (p. 181) by E. Orhan Brigham. 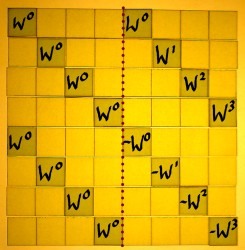 The second scheme differs from the first one in the sense that it starts with the square roots of unity, instead of ending with them. Recall that we work from right to left. Further, the identity parts and rotation parts are now left/right organised, instead of top/bottom. The output of this scheme would have a decimated spectrum as well. 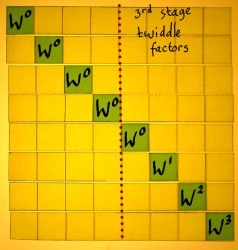 The twiddle factors do not appear in their natural order. 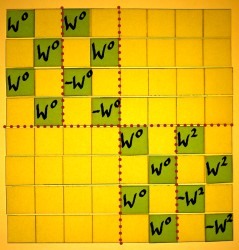 From my small example it is hard to see the pattern of it, as we only see W2, W1 and W3. 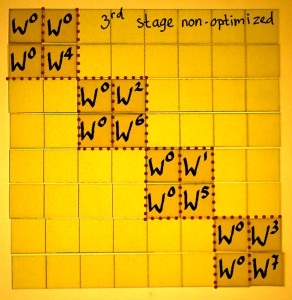 If the third stage is depicted in it's non-optimized form, it becomes clearer. This is a pattern we have seen before. It is bit-reversed. Of course, this will have a different meaning in every stage of the FFT. 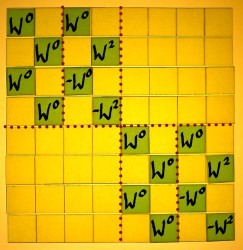 The 8th roots of unity have three bits, the 4th roots have two bits, and the square roots have one bit. 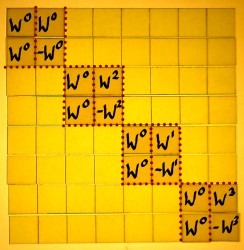 Downsampling W1 gives W2, and downsampling one more time gives W4. Then it makes sense, being the correlation output of harmonic number 4. Decimation brings us to subsequent schemes, in which the input signal is reorganised with indexes bit-reversed, before all other operations. The output will appear with the frequencies in natural order. 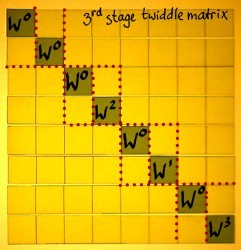 This scheme has 'first-twiddle-then-add&subtract'. As an example, I sketch the third FFT stage here below, because in the other ones there is less to see. 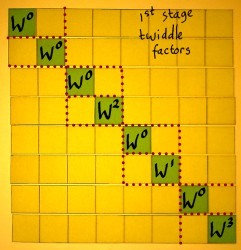 The twiddle factors appear in their natural order. 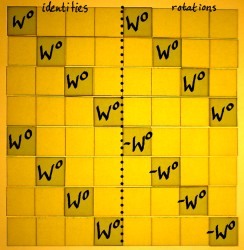 These were the four basic radix 2 FFT forms, illustrated for N=8. Modifications of them are conceivable, for instance a phase reordering inbetween each stage, to have input and output in natural order directly. For convenience, the tables of the four schemes are showed once more, next to each other.